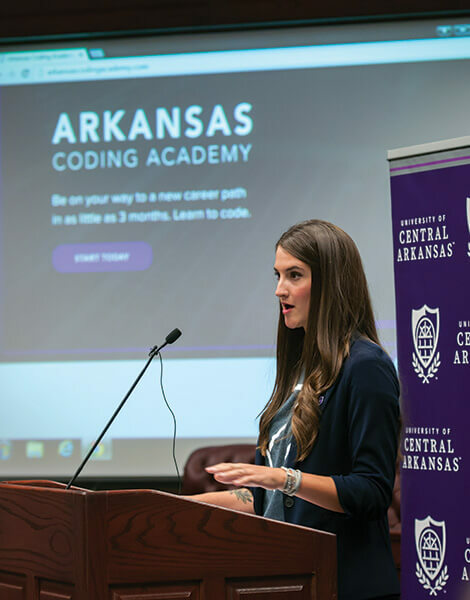 The Arkansas Coding Academy this month announced plans to expand its services by opening a new campus in Fayetteville. The academy is a program of the Division of Outreach and Community Engagement at the University of Central Arkansas. It offers an alternative education path to careers in the information technology sector through expedited training programs. Students can take a full-time, three-month course or a part-time, six-month course, where they learn core concepts of software development. Upon completion of the course, students are considered entry-level developers poised to enter the software development workforce. There are no special prerequisites or educational backgrounds required for the program, which costs $6,500 and includes a laptop, books, and software. Officials said 82 percent of the program’s 80 graduates have found employment since the program was founded in 2016. The academy has campuses in Conway and Little Rock. The Fayetteville campus is expected to open in May, but officials have not yet said where the facility will be located. For more information or to apply for classes in Fayetteville, visit arkansascodingacademy.com.